In the early years of Dungeons & Dragons, players searched by telling the dungeon master where they wanted to look, and then the dungeon master told them if something was there. The game resolved most actions using back and forth dialog, plus clear cause and effect. Before skills and core mechanics, resolution relied on the on the logic of the game world. See A Lack of Ability Checks Shaped How People Originally Played Dungeons & Dragons. Old-school gamers swear by this method, and with good reason: It grants players, and not the dice, control over their characters’ fates. It makes player decisions and ingenuity count. The details of the game world matter. But some tasks demand a character’s talents to succeed, so this sort of resolution cannot cover every action: listening at doors, creeping behind an enemy, balancing atop a rope spanning a moat. Once skills and ability checks entered the game, they began to spread. Over the years, D&D’s rules encouraged players to rely more on checks. This trend peaked in fourth edition. In skill challenges, players overcame obstacles by explaining how their character’s skills could help, and by rolling checks. As written, players never needed to engage the game world or to show ingenuity. They just found the best applicable skill. Although fourth edition promoted checks more than many players wanted, the emphasis brought advantages. In the original D&D game, characters that shared a class and level all played about the same. Without ability checks, their ability scores rarely affected play. Without skills, they all featured the same capabilities. The fourth-edition designers created a game optimized for a style of play where players built awesome characters and then showed them off in encounters—either battles or skill challenges. Character building became as much a part of playing D&D as time at the table. By emphasizing checks, the game highlights each character’s talents and limitations. When a player invests in a persuasive character with a high charisma, they can win allies with a die roll. On the other side, if you play a character with an 8 Intelligence, your own brains cover some of your character’s stupidity, except when you make intelligence checks. You might solve a real puzzle, but an abstract one makes your character face a check. In the fourth edition, designers made the mistake of emphasized the parts of D&D that video games do best. If you want character building, electronic games offer more options, and you can play your character at any hour from the comfort of home. Tabletop games thrive when the focus on aspects that computers can’t match, so why focus on choosing skills and playing against random chance? By joining live players and a DM, we gain the ability to speak as our character and attempt any action, even ones not in the rules. Sometimes a check can provide a shortcut for tasks that could prove dull. If the players want to search a cluttered room, but want to avoid the tedium of describing how they cut the straw mattresses, sift the dirt in the flowerpots, and so on and on, a check seems like a time saver. Fourth edition’s Streetwise skill seems contrived to skip the urban role-playing that the designers found tiresome. As a DM, I steer the game away from activities no one seems to enjoy, but I feel wary of letting someone use a die roll to cheat the other players out of the fun of interacting with the game world and actually playing the game. However, if the entire table agrees, we can just substitute a Wisdom (Survival) check for that trip to Tomb of Horrors. Different players favor at different parts of the D&D game. Some lavish attention on crafting characters. For them, the fun at the table comes from showing off their creations. Fourth edition was made for players like this. Some players use their character to shape the sort of game they want to play. Sometimes this means making a character good in an area where the player feels weak. If you lack charm, but play a charismatic paladin, you can let a persuasion roll do all the talking. Even the most timid player can enjoy the benefits of a magnetic personality. Sometimes players craft characters able to breeze through challenges that the player finds tiresome. They claim that their character has more brains, and ask to solve a puzzle with a check. I once met a player who optimized characters for combat because he wanted to speed through the battles. We gather at the game table to enjoy the tactics, ingenuity, and silly voices. Most of the time, we would rather act as our character rather than just rolling dice on their behalf. More than once I’ve seen a player make an impassioned speech in character, asking the Baron, for instance, to defend the settlers. The player’s voice trembles with passion as she speaks of courage, loyalty, and the honor of the Baron’s ancestors, calling their spirits by name. The player steps down from atop a chair to applause and tearing eyes. But then, feeling bound by the system, I ask for a Charisma (Persuasion) check with the advantage earned for an outstanding performance. Then the orator rolls, and flubs. Sorry, you fail. In situations beyond diplomacy, specific actions can also make a check seem pointless. If someone taps the bottom of a chest looking for the secret compartment, skip the search check and just reveal the location. If someone describes an ingenious use of leverage to lift a gate, skip the strength check. We all savor the split-second drama of waiting to see the outcome of a die roll. Every player remembers a moment when a lucky roll made a crazy, long-shot scheme work, or when bad rolls caused a plan to unravel and forced everyone to plan B and then to C. If these moments came from a DM’s ruling, they would seem like cases of DMs steering the game to fit their story. The magic comes because the dice twisted fate, making a surprise that proved unforgettable. Sometimes an extreme roll lets a 98-pound weakling batter open a door or causes the mighty barbarian to fall from a rope. Such outliers diminish the qualities that make characters unique. On an unlikely success or failure, sometimes I use some outside cause to explain the fluke. If the barbarian falls, did the knot slip loose? If a clumsy oaf picks a lock, did someone just forgot the latch? By narrating a cause outside the character’s control, the effect remains, but the character still feels consistent. If an elite acrobat sprints across a swaying rope bridge, do you require a check or just let them show off? If someone specifically examines the bottom of a chest, do they still need a roll to find the hidden panel there? Can someone skip a puzzle if their genius character aces an intelligence check? If someone offers a generous bribe to a corrupt guard, do they still need persuasion? I don’t know, but when I reach the table, I can judge. Some players love to roll dice. For them, the game only moves when they make rolls. Others like speaking in funny voices or solving puzzles and boast of sessions where no one rolled a die. Most players favor a style in the middle. Original D&D and fourth edition mark extreme approaches to ability checks, from no checks to a game that can—if players choose—rely entirely on checks. Each approach brings some advantages. In our games, we can adopt either style—or find a balance that suits us. This entry was posted in Advice, Role-playing game history and tagged ability checks, player skill. Bookmark the permalink. Sometimes you just let the acrobat run across the rope bridge without a roll. Depends how you want the adventure to play out. Are you willing to risk a 1 roll which would have the acrobat plummet to his death, and change the whole dynamics of the game? a 1/100 is too common for many events in reality. Some things are more like 1/1,000 chance or 1/10,000. Your elite acrobat can always roll to see if he makes it to the other side in two jumps with his hands in his pockets. Failure does not mean he falls. One issue that is nice about skill checks is I, the player, don’t need to be good at the skill or (in some cases) consider all options. Say, my character wants to bluff an NPC. I might not have the personal charisma or speaking skills to bluff a 5 yo, but my character has an 18 charisma so they ought to be able to do it. To me, that is role playing. I want to roll, I don’t what to have to “bluff the DM”. I don’t have these skills, but my character does. I can’t lift a sword or even know how to swing one, but my character does. This bugs me quite a bit, should I use meta-gaming to remember to have my player scan a room upon entry? Or does my character’s high passive perception skill take care of that for me? As such, the DM performs the roll and announces the vase we have been looking for is on the bookshelf along the wall. I have the same issue with some video games. I might not be able to smash ‘A’ a thousand times a second in hopes of getting the first shot off, but my character with 20 dexterity ought to be able to do it without my intervention. That said, rolling skill checks for every little thing is quite annoying. The 5th level acrobat ought to be able run across a 20′ 2″ ledge without risk of falling (or rolling). I think the DM and the players need to come to some sort of “common ground” on the issue. Obviously this varies from group to group. I have never played at a ‘con’ I often wonder how the mix of players (and DMs) affect this issue (to roll or not to roll). I assume it has to be a point of frustration for some groups. I dislike how the game has trended toward players making rolls before a judgment. I like auto success unless a failure means something. It’s hard to mix the new with old as we are seeing with TftYP. “How do you search,” is a common phrase I have been using. So to start let’s get past the idea that DMs didn’t use Ability checks back in the day. Not only were there specific ones (thief’s skills, for example), there were others, and the rules (especially AD&D), were there to do others. What wasn’t there was a common and codified system for ability checks. Just like there wasn’t wasn’t a common system for anything else. Sometimes it was a d6, sometimes a d20, and others a d%. You are correct in that it generally wasn’t the first option. But, I think there’s another reason for this, and it doesn’t have to do with what’s in the rules. It’s a question of who is “in charge” of the rules. I think what most people miss when considering rules like this, is that the responsibility for the rules has shifted, and that has altered the way the rules are followed. Through AD&D (1e) the assumption was that the players only knew what they needed to play their characters. Even the combat system was in the DMG, and the DMG (and other DM materials) were explicitly marketed for DMs. When a player wanted to do something, they knew it was up to the DM to decide not only if they succeeded, but how to determine whether they succeeded. In the middle of 2e, TSR figured out that there are more players than DMs. If they marketed books to the players, they could sell more. But more than that, it shifted the decision of when to make an ability check from the DM to the players. The rule is right there – if I want to be able to do something, all I have to do is make an ability check. When the players are in charge of ability/skill checks (and they are right now), it changes the dialog. The player responsibility in AD&D was to tell the DM what they wanted to do and how they intended to do it. The DM was responsible for adjudicating a chance of success, and if needed, how to determine that success with a die roll. The player responsibility now is to know and follow the rules in the PHB. The rules for ability checks are simple. All the player has to do is roll a d20 and add modifiers. The DMs responsibility now is to set a DC. The DM knows this is several month’s worth of pay, so it will automatically succeed. No check is needed. There are really two issues I see with the way Ability/Skill checks work. One is the mechanics – and while I think 5e is on the right track, it’s not quite there. I have my own system. But the other issue I see that is I think a big part of the reason why people don’t like ability/skill checks is how the rules are engaged. In my campaign, only the DM can request a skill check. You tell me what you want to do and how, and I’ll ask you to make a check if needed. It’s basically the same as combat. You don’t say, “I make a to-hit check” against the orc. 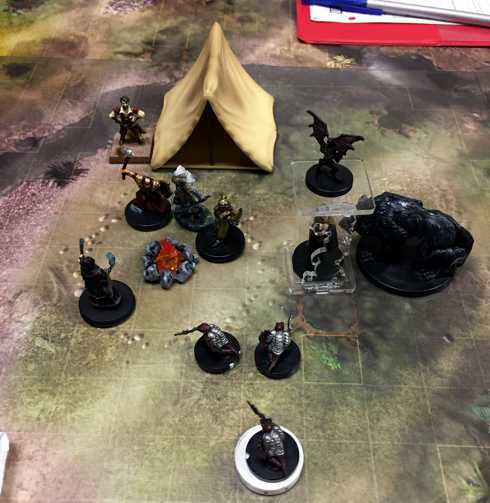 No, you say, “l attack the orc with my axe” and then you roll the dice. The further I get away from skill checks, the more fun I find that we can have. I still use them, but try to avoid them as much as possible. While I give the players more freedom to act, I also found that I sometimes like to role the dice for the players from time to time; particularly when it is a faith issue. It goes back to milking drama, for instance, if one player decided to tie a complex knot which will be supporting the weight of the party, I will roll the skill check behind the screen and won’t tell them what the results were. They feel that sense of risk; they don’t like it! But they do enjoy that feeling. You’re still actually “making skill checks,” you’re just adjudicating success/failure instead of making a die roll. That is, you’re primarily using passive skills. That’s what I do. I think that passive Skills are the best part of the 4e/5e mechanic. They give you a baseline – they tell you what the character is good at, and how good. Combined with the Take 20 concept – 20 + modifiers, then you know the ceiling as well. As for skill checks themselves – in my campaign, most of the time if they need to make a skill check any failure just indicates the amount of time they need to finish. Just subtract the roll from the DC. Since you know they CAN do it (it’s below their ceiling), you know they’ll eventually succeed. They don’t know how long it will take, and that time differential is what gives you drama. If taking longer won’t increase the drama, then don’t roll, they just succeed. You can still apply circumstantial modifiers. Of course for certain situations there is always the possibility that they’ll suffer more severe results. That doesn’t change. Opposed checks are normal (although more often than not they are passive Skills – such as Stealth against Perception). Making an active check requires the use of an Action, when in combat. Outside of combat making active checks just takes more time. Most of the time, this becomes automatic as a DM, you don’t really need to check DCs, etc. But the numbers give you something to base your adjudications on.